← Don’t forget about this one completists! On an impulse stop at Comically Speaking I saw this huge mother on the shelf. The sculpt of this figure is pretty great – and the best part – it’s not just “battle action!” There is Punching Action, Kicking Action AND Smashing Action! You take the joy stick provided and press the trigger to make the Hulk do any of the motions displayed on the front. I like how the joy stick has a little Hulk face on it. But surely the best part is the size of this figure. The large Hulk figures we got for the 2008 were a little less than lack luster. I was not only disapointed by the sculpt – but the paint job and coloring – this figure is way better – it doesn’t have the neon green and lazy eye issues the 2008 does. I even like the “screaming” open mouth expression. Top-notch character all the way! 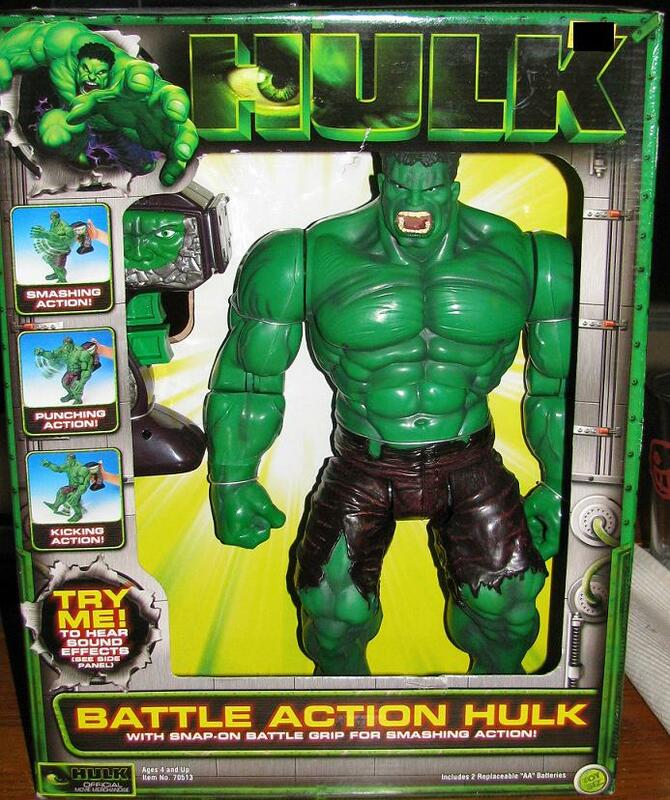 This entry was posted in Green Hulk, Hulk Action Figure and tagged 2003, Hulk Action Figures. Bookmark the permalink. Yep Ryan, this is an amazing hulk figure! And yeah, 2003 figures killed the 2008. 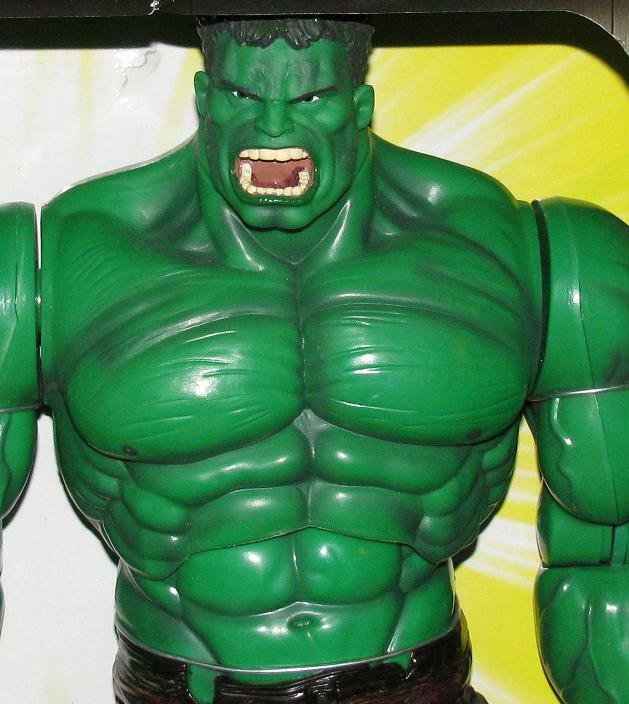 Hasbro surley let us hulk fans down with that line. 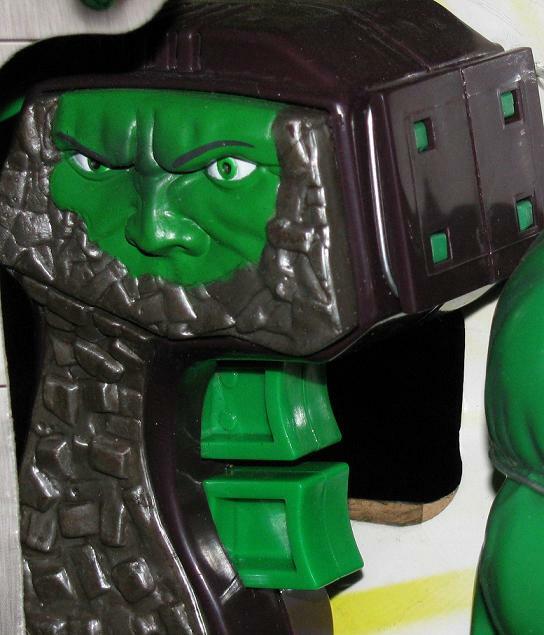 The toy biz line had also had the 2 greatest hulk figures ever, the 13 inch roto cast hulks! They simply cant be beat! And gammapup, I watched 2003 hulk 2 night ago as my wife had never seen it. Been puting it off as I really thought it was woefull. But i gotta say, i liked it far more than i remembered. Yeah some crap parts, like hulk growing big, the ending with the giant jelly fish and many more, but I liked how it was pretty dark. Was not a kids film at all. And while I love the 2008 film, I’m still waiting for the deffinative hulk movie. No one seems to get it right! they always have to change something! while i liiked movie abominaition, did they really have to change him? do we have to base fantasy movies in reality and make realistic answers out of made up nonsense??? I doubt we will ever see a 3rd hulk mive, but if we do, I hope they get it perfect! super cool fig for sure!!! you are just now getting this Ry? i still have on, in the box too…..